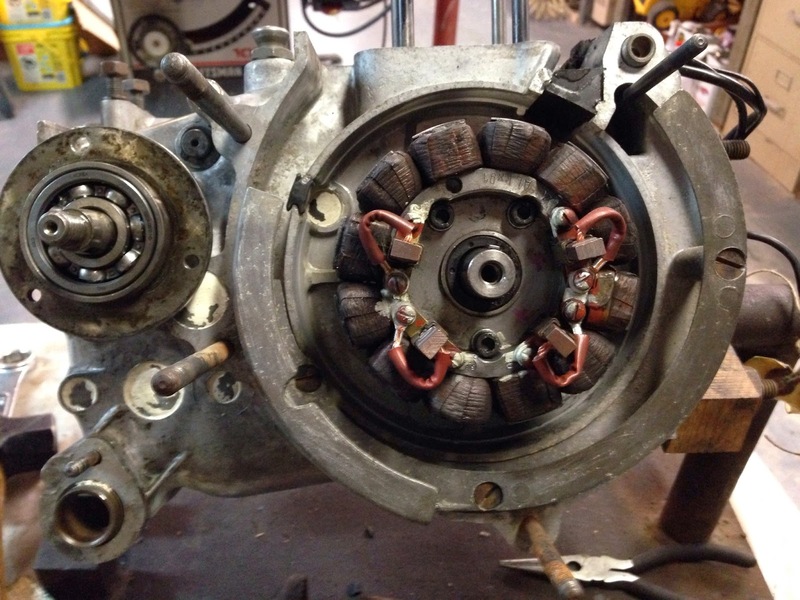 What started as a short post about stator brush replacement has turned into a whole article about how I rebuilt my stator because of a pesky intermittent ground short. It was probably the most frustrating Heinkel project I’ve ever undertaken! Don’t worry though; I’ve written up a guide that should answer most of your questions. 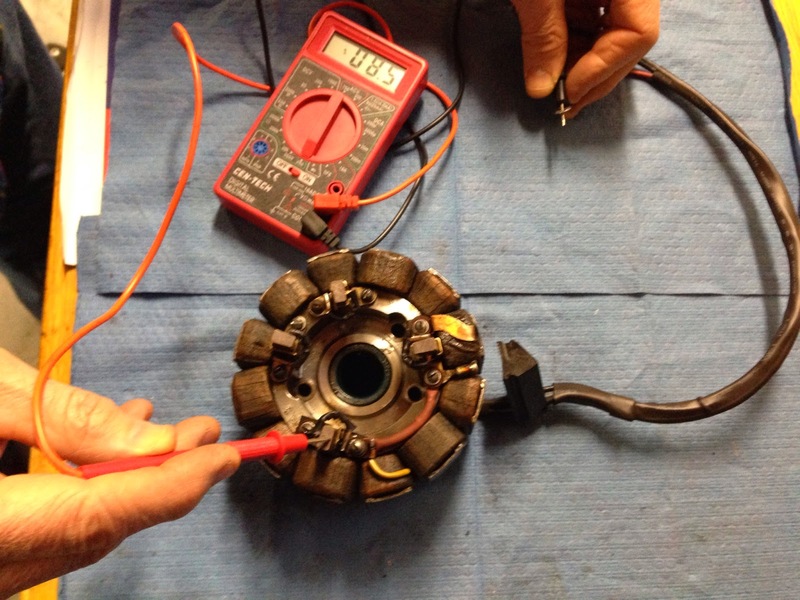 The Stator and Armature in a Heinkel start the engine and charge the battery. 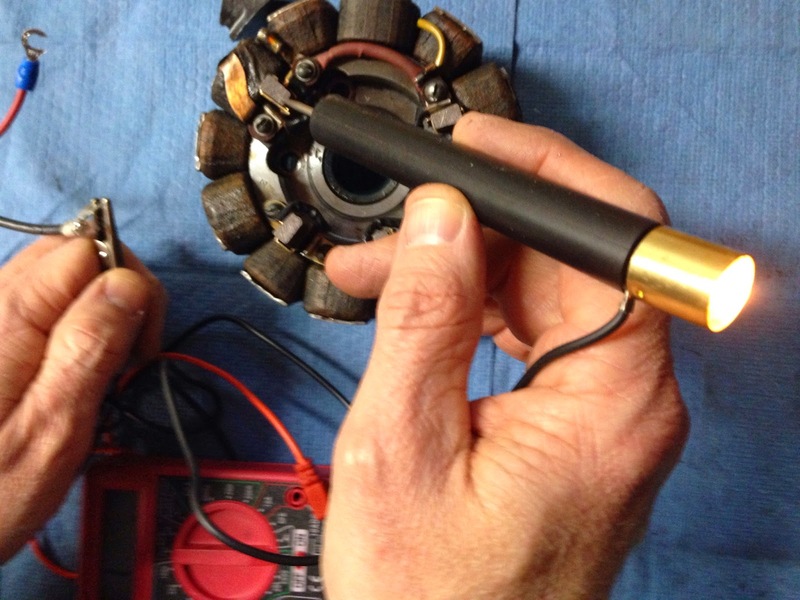 The Stator has two sets of coils wired together and attached to a metal frame bolted to the engine case. There’s a set of “positive” carbon brushes attached to (but insulated from) the case, as well as a set of negative brushes. The end of the crankshaft protrudes through the frame, and the armature is attached to this. The big coils are used to start the engine, and the small ones charge the battery. As the crank spins the armature spins and rubs against the positive and negative brushes, thereby starting the car, creating electricity, and charging the battery. 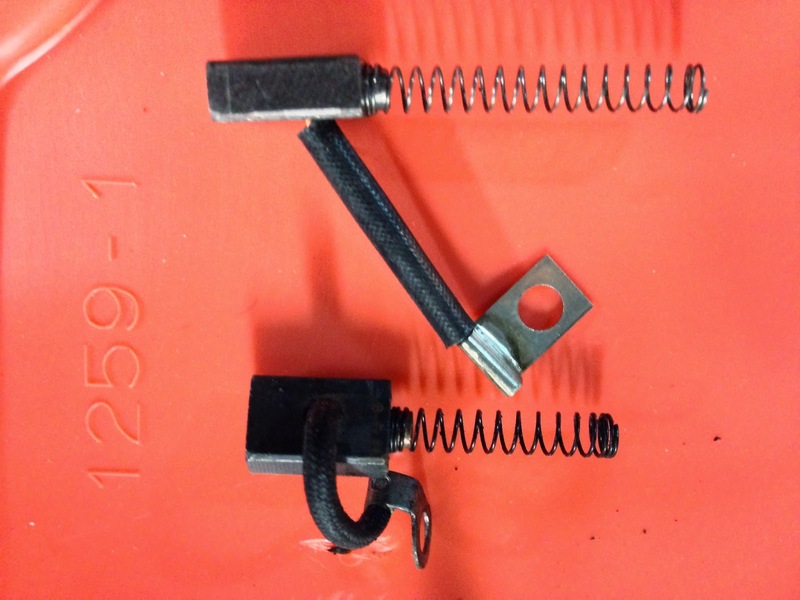 If you are rebuilding your engine the maintenance on the stator/armature is pretty straightforward: Remove the armature by using a special tool to pull the armature off of the crank (I’ll talk more about armatures in another article). 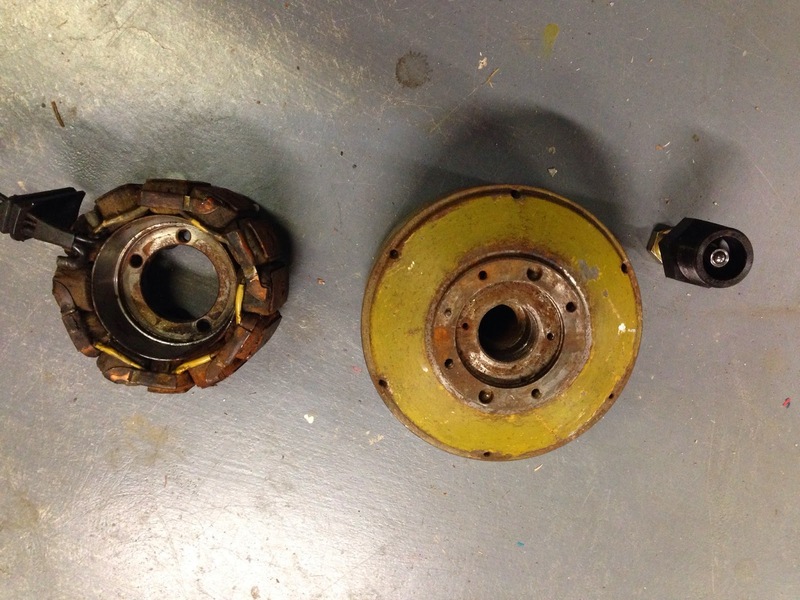 Heinkel Stator, Armature, and Armature Puller. Check the carbon brushes to make sure they are not excessively worn. More than 5mm between the copper wire and the end and you are good. If you have less, then replace them. Both the English Club and the German Club have replacement brushes, and you can also check a local motor rebuilding company; they may have what you need. 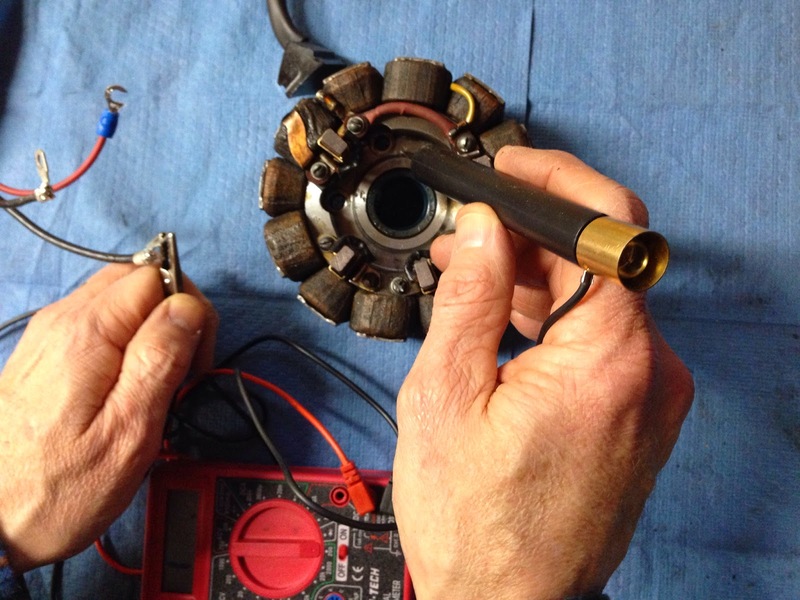 If your engine has been rebuilt, chances are you’re in good shape; you can remount the armature and be off and running. If you’re working on an engine with an unknown history, then it behooves you to perform more disassembly and more comprehensive testing. 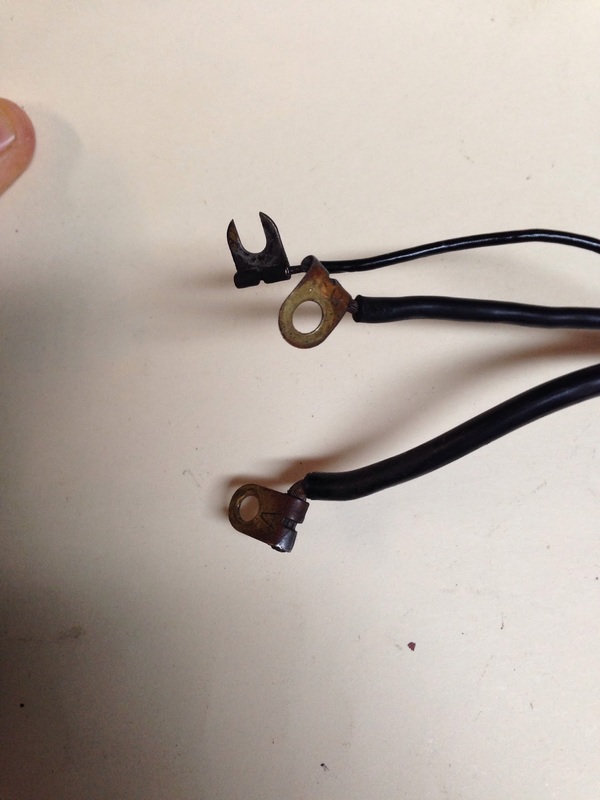 Wire insulation: I’ve checked six or seven stators and about half have cracked or damaged wire insulation. Several have had superficial repairs. If you have damaged insulation I will provide some suggestions on how to fix this in a later article. 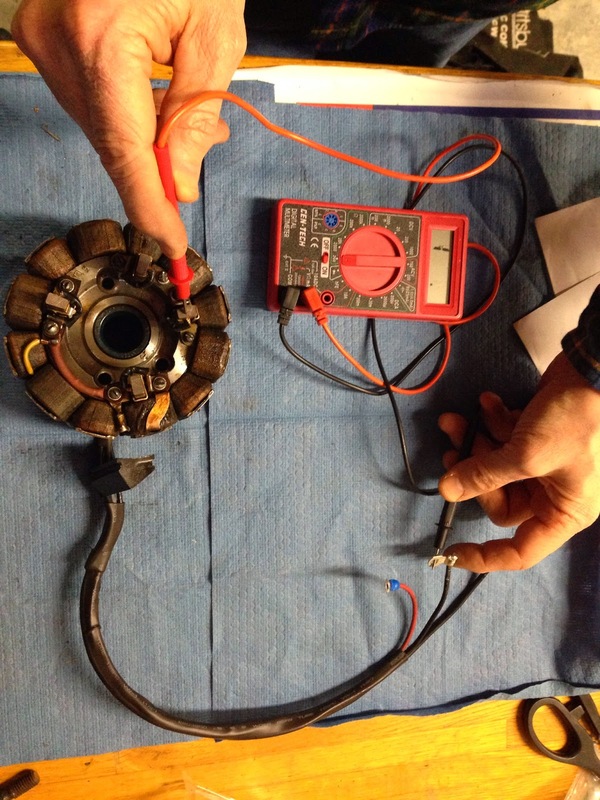 Loose connections: There are three wires leadiing to the stator from the control box. The two larger ones are soldered to connections on coils. If they are loose they can be resoldered, but if the insulation on the wires is cracked you’ll have to replace the wires. The third (small) wire connects directly into a coil and will need to be spliced and heat shrunk. Terminal ends: These are where the three wires connect to the regulator control box. The two larger wires have “flag” connectors, and the smaller wire has an open ended connector. If these are in bad shape you will want to replace them with similar connectors, as the connection block on the control box is tight and it’s hard to bend the wires to connect and not touch the box or other wires. Now we’re ready to assess the quality of the circuits. These tests I derived from an excellent article by Mike O’Ballance that appeared in the September 2002 Heinkel Club Cruiser News Review article entitled “The Heinkel Engine, Starting and Battery Charging”. Mike recently passed away and will be sorely missed by many Heinkel enthusiasts including me. You’ll need a multimeter and continuity tester with a light bulb. I check circuit continuity first and then move on to the mulitmeter. I’m sure you can use the multimeter for both; I’m just used to the rewards I get from having the bulb light up when the circuit is working. I wouldn’t spend a lot of money on a multimeter unless you have other uses for it; Harbor Freight Tools in the US often gives them away with a coupon. 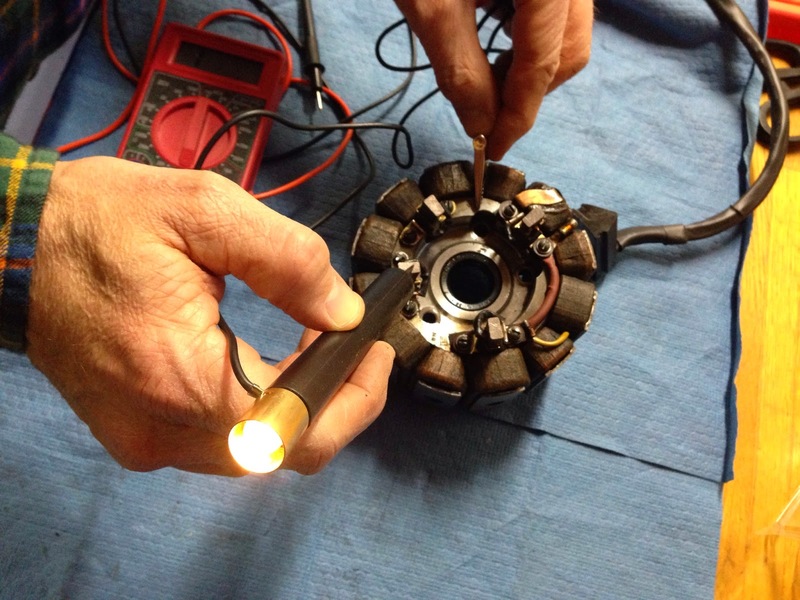 Test 1: Are the positive brushes isolated from the metal stator frame? : Touch one end of the tester to the frame and one to each brush. If the bulb lights then you have a ground fault you will need to solve. Mine weren’t, but more on that later. Test 2: Are the negative brushes ground to the metal stator frame? : Touch one end of the tester to the frame and one to each brush. If the bulb lights then you have a ground (which is good). Test 3: Test the starter coils wire (the fat one) to metal frame: There should be no connection and the bulb should not light. If the bulb lights you have an electrical fault to fix. Test 4: Test the field coils wire (the middle one) to metal frame: There should be no connection and the bulb should not light. Test 5: Test the field coils wire (the middle size one) to the positive brushes: The continuity bulb should light up. Test 6: Test the starter coils wire (the large size one) to the positive brushes: The continuity bulb should light up. Test 7: Test that the positive brushes have a connection to each other. Preparation: Get a baseline on the multimeter. Set the meter to the lowest ohm setting, touch the leads together and let the numbers settle down. Mine measured 3.5. So, any measurement I take I’ll need to subtract 3.5 to get the correct reading. Test 1: Resistance between the positive brushes: There should be no resistance. In my multimeter this is indicated with a “-1”. 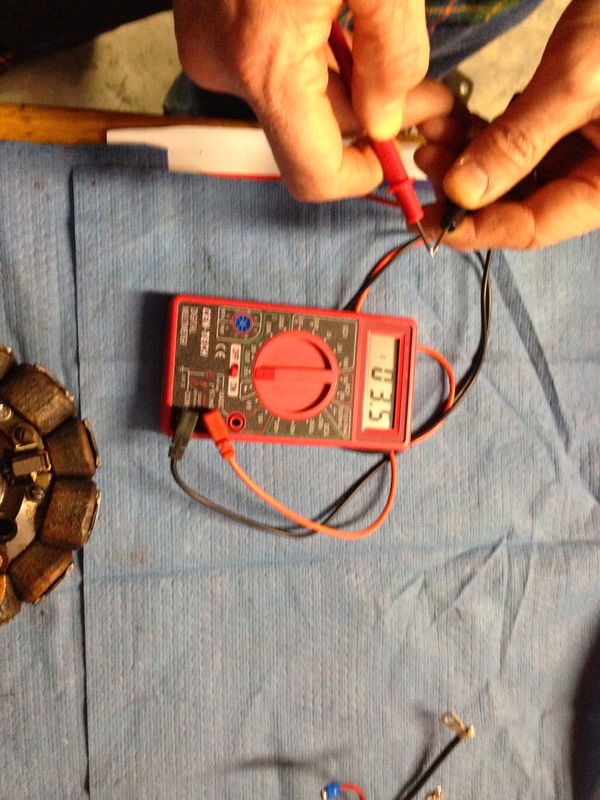 Test 2: Test the resistance between the thin wire and the positive brushes: There should be 5 ohms of resistance here. If there’s less then you might want to check the insulation of the coils. 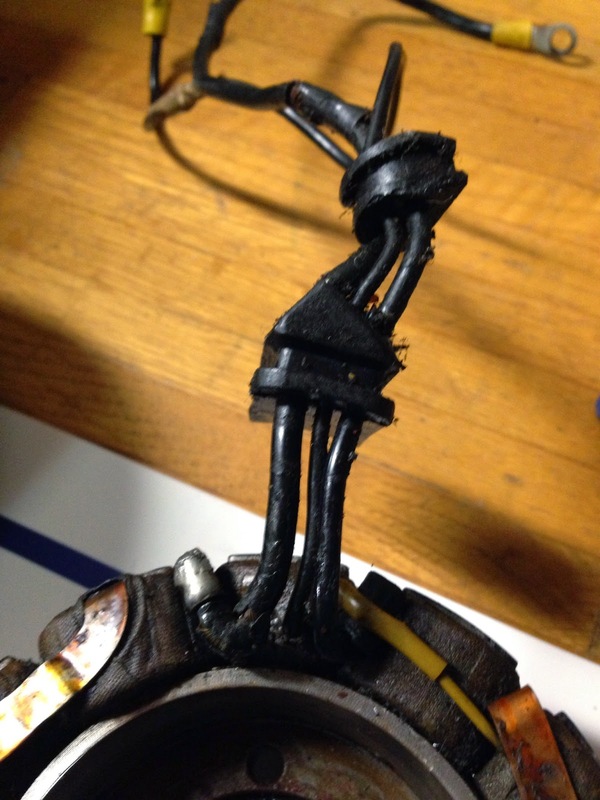 According to Mike O'Ballance, this indicates a breakdown in the coil insulation. Test 3: Test the resistance between the middle size wire and the positive brushes: The resistance should be zero (1 on my meter). If you pass these tests than you are in good shape and ready to go. If you fail, you’ll have to do some more work. What kind of work? That will be the subject of the next installment.